Loaded with gorgeous green broccoli and topped with crispy bacon, this cheesy comfort food is ready to rock your face off. 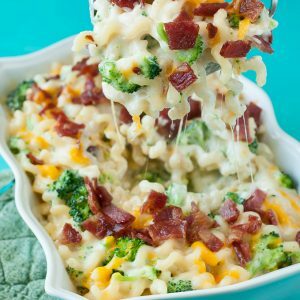 My family goes bonkers over this bacon broccoli mac and cheese! Measure out all your ingredients, chop your broccoli, and grate your cheese. Boil pasta per package instructions (times will vary a smidge by brand/shape) until al dente. Drain and set aside one done. While the pasta cooks, start your sauce and broccoli. Cook broccoli via your favorite method. I'm a big fan of quickly blanching broccoli in boiling hot water until the florets turn bright green and tender. For the sauce, melt 1/2 stick of butter (1/4 cup) over medium heat. Add flour and whisk constantly while the flour cooks off into a roux, approx. 3 minutes. Season with garlic powder, salt, and pepper, to taste. Slowly pour in your room temperature milk, whisking constantly until smooth and fully incorporated. Remove from heat. Sauce will thicken as it rests. Add pasta and broccoli florets to a 9-inch baking dish. Sprinkle 5-6 ounces of freshly grated cheese on top of the pasta. Pour your cream sauce over the noodles and cheese. Use a rubber spatula to fold it all together. Feel free to top with a little extra cheese if you'd like, then top with bacon. Bake on center rack at 350 F for 20 minutes, until hot and bubbly. CRAZY FOR CHEESE? You can add a little extra on top before baking to amp up the cheese-factor even further! I made mine with a mixture of sharp white cheddar and medium cheddar cheese but love adding gouda to my mac and cheese as well. Gouda and cheddar are amatch made in heaven! I highly suggest using a good quality brick or wedge cheese and grating it yourself - the flavor and texture will be spot-on this way!